Daniel David Norris (born April 25, 1993) is an American professional baseball pitcher for the Detroit Tigers of Major League Baseball (MLB). He previously pitched in MLB for the Toronto Blue Jays. The Blue Jays drafted Norris in the second round (74th overall) of the 2011 MLB Draft. Baseball America rated Norris as the 91st best prospect in baseball prior to the 2012 season. He was ranked as the number 4 prospect in the Blue Jays minor league organization on July 26, 2013, when the revised Top 100 Prospects list was released. Norris began his career with the Rookie-Advanced Bluefield Blue Jays and Low-A Vancouver Canadians in 2012, where he pitched to a combined 2–4 record, an earned run average of 8.44, and a 1.78 WHIP. In 2013, Norris split time with the Class-A Lansing Lugnuts and High-A Dunedin Blue Jays, and finished the season with a 2–7 record, but made a major improvement with his ERA, which dropped to 3.97. Norris began the 2014 season in Dunedin, and earned a 3–0 record with an ERA of 0.80 through his first 9 starts. On June 3, 2014, he was announced as the Pipeline Pitching Prospect of the Month of May. He posted a 1–0 record and a 0.68 ERA over 5 starts to win the award. On June 15, he was called up to the Double-A New Hampshire Fisher Cats after posting a 6–0 record, 1.22 ERA, and 1.025 WHIP in 13 starts with Dunedin. Norris appeared in the 2014 All-Star Futures Game on June 24, 2014. As of the 2014 midseason update, he was considered the Blue Jays' top prospect, and 25th overall prospect in baseball by Baseball America. With New Hampshire, Norris had a 3–1 win-loss record, 4.54 ERA, and struck out 49 in 35​2⁄3 innings before he was promoted to the Triple-A Buffalo Bisons on August 7. Making his Triple-A debut pitching in the first game of a double-header on August 10, Norris earned the win, pitching six innings against the Durham Bulls and gave up only two hits while striking out 10, including Wil Myers, on a rehabilitation assignment for the Tampa Bay Rays. In his following start, he struck out a career-high 13 over 5​2⁄3 innings, making him the first pitcher in Bisons history to have back-to-back starts with at least 10 strikeouts. Norris pitched five innings and earned his third win in three tries on August 21, against the Scranton/Wilkes-Barre RailRiders. He struck out nine, walked three, and gave up one hit, a home run. While speculation circulated that the Blue Jays intended to move Norris to the bullpen following his third Triple-A start, they instead announced on August 22 that he would continue in a starter's role. In total for 2014, he posted a 12–2 record with a 2.53 ERA and 163 strikeouts over 124​2⁄3 innings. On September 3, Baseball America named him to their First Team All-Stars for 2014. He was named to the MLB All-Prospect Team on September 26. On September 1, 2014, Norris was called up to the Blue Jays as part of the September roster expansion. On September 5, he made his MLB debut against the Boston Red Sox, striking out David Ortiz. Blue Jays manager John Gibbons announced on September 23 that Norris would make his first major league start on September 25, and would pitch 2–3 innings. Norris pitched 3​1⁄3 innings and yielded 2 earned runs on 1 hit, 2 walks, while striking out 1. In total for 2014, Norris pitched 6​2⁄3 innings with the Blue Jays, and post a 5.40 ERA, 4 strikeouts, and a 1.50 WHIP. Norris had arthroscopic surgery on October 7, 2014 to remove bone spurs and loose bodies from his left (pitching) elbow. On January 21, 2015, Norris was named by MLB as the third-best LHP prospect in baseball. 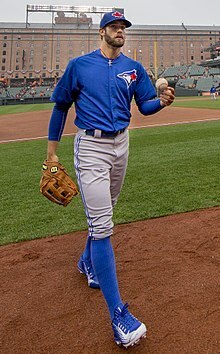 In 2015, MLB named Norris as the number 1 Blue Jays' prospect, the number 3 left-handed pitching prospect in baseball, and the 17th best prospect overall. He opened the 2015 season in the starting rotation for the Blue Jays. After his fifth start, Norris was optioned to Triple-A Buffalo on May 1. 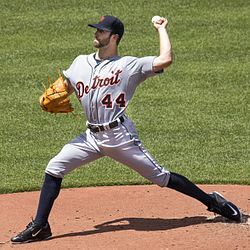 On July 30, 2015, Norris was traded to the Detroit Tigers along with Matt Boyd and Jairo Labourt in exchange for David Price. In his debut for the Tigers on August 2, Norris pitched 7​1⁄3 innings and struck out five Baltimore Orioles hitters, allowing one walk, four hits, and just one earned run on a solo home run by Chris Davis in the fourth inning. Following the home run to Davis, Norris retired the next 12 batters in a row, earning the win in a 6–1 Tigers victory. On August 19, 2015, Norris became the first Tigers pitcher to hit a home run in his first career plate appearance, the first pitcher to do so since Tommy Milone in 2011, and the first American League pitcher to do so since Esteban Yan in 2000. He also became the first Tigers pitcher to homer since Jason Johnson did so on June 8, 2005, and the first American League pitcher to ever hit a regular-season home run at Wrigley Field. Norris exited the game in the fifth inning with a right oblique strain, and was placed on the disabled list the following day. Norris was recalled from the disabled list on September 16. In his second start after returning from the injury, he threw five perfect innings in a September 22 game against the Chicago White Sox, but was pulled from the game after reaching a predetermined pitch count. The Tigers eventually lost the bid for a combined no-hitter with one out in the ninth inning when Neftali Feliz, the fifth pitcher used, surrendered a triple to Tyler Saladino. Norris finished the 2015 season (combined stats between Toronto and Detroit) with a 3-2 record in 13 starts, while compiling a 3.75 ERA and 45 strikeouts in 60 innings. On March 24, 2016, the Tigers announced that Norris would start the 2016 season on the disabled list, due to a lower back issue suffered during spring training. He was recalled to the Tigers on May 11, 2016, but made only a one-inning appearance against the Baltimore Orioles on May 12 before being returned to AAA Toledo. Norris was recalled again on June 21 following the demotion of Matt Boyd, and made his first start of the 2016 season on June 23. After pitching two innings plus one batter in a July 4 start against the Cleveland Indians, Norris was removed from the game. He was later diagnosed with an oblique strain, the same injury he suffered in late 2015, and was placed on the disabled list for the third time in his career. Norris returned to the mound for the Tigers on August 9 to start a game against the Seattle Mariners. In a September 12 game against the Minnesota Twins, Norris struck out a career-high 11 batters in just ​6 1⁄3 innings. Norris made 13 starts for the Tigers in 2016, finishing the season with a 4–2 record and a 3.38 ERA, while striking out 71 batters in ​69 1⁄3 innings. Although he logged the most innings of his young career (​101 2⁄3), Norris took a step backward in 2017, posting a 5–8 record and a 5.31 ERA while striking out 86 batters. Norris dealt with hip and quadriceps issues during the season, and admitted he dug a "deeper hole" by trying to come back too soon from a DL stint. Norris started the season in the bullpen as a long reliever. He made a spot start on April 29 but came out of the game in the third inning with groin tightness, which he has been dealing with since 2017. He was placed on the 10-day disabled list the next day which marked the fourth straight season on the DL since the Tigers acquired him. It was announced a day later that the injury would require surgery and Norris will miss 8 to 12 weeks. He was moved to the 60-day disabled list on May 8. Norris returned from the disabled list on September 1, but came out of the game in the fifth inning with a left leg injury right after giving up a 2-run home run which earned him the loss. The home run was the only hit he gave up that game. During the 2018 season, Norris failed to earn a win in eight starts and three relief appearances, going 0–5 with a 5.68 ERA. On January 11, 2019, the Tigers avoided arbitration with Norris, agreeing on a one-year, $1.275 million contract. Norris features four-seam and two-seam fastballs that average about 92 mph and top out at 96 mph. He also throws a slider and a circle change that both average about 85 mph, and a curveball in the mid 70s. He learned all of the pitches by his senior year of high school. In 2012, he overhauled his pitching mechanics to improve the repetitiveness of his delivery. Norris's family has owned a bicycle shop in Johnson City, Tennessee, for more than 80 years. In the offseason, Norris lives by choice in a 1978 Volkswagen Westfalia van, nicknamed "Shaggy". His unconventional lifestyle can be described as nonconformist and minimalist, and has raised eyebrows in MLB. Prior to the 2015 season, Tony LaCava, Toronto's assistant general manager, said of Norris "He takes care of himself as well as anybody we've got. He's in great shape. He competes on the mound. If that wasn't the case, maybe we'd be more worried about some of the other stuff. But right now, the van and all that is secondary. He has great values, and they're working for him." Despite his $2 million signing bonus, Norris lives off just $800 a month. In an interview with ESPN he was asked why he chooses to continue to live so conservatively. He asked back, "Who am I to deserve that? What have I really done?" He has also said, "I'm actually more comfortable being kind of poor," as it helps him maintain a minimalist lifestyle and resist conformity. On October 19, 2015, Norris announced through his Instagram account that he had been diagnosed with thyroid cancer. He was diagnosed the previous April, and with a doctor's consent, he continued playing and delayed treatment until the end of the season. On October 29, Norris announced he was cancer free following a successful surgery to remove a malignant growth from his thyroid. One of Norris' hobbies is photography. During the 2015 season, he acquired professional photographer Ben Moon's Canon EF 85mm portrait lens, and the two became friends. That offseason, the two went on a road trip together, from Norris' home state of Tennessee to Oregon, where Moon is based. Moon has turned footage from the trip into a short film, titled "Offseason." ^ Heneghan, Kelsie (April 12, 2014). "Norris uses full arsenal to beat Manatees". MiLB.com. Retrieved May 21, 2014. ^ "2012 Top 100 Prospects". Baseball America. February 21, 2012. Retrieved April 19, 2012. ^ Chisholm, Gregor (July 26, 2013). "Pitching remains strength in Blue Jays system". MLB.com. Archived from the original on 2013-12-14. Retrieved July 26, 2013. ^ "Daniel Norris Minor League Statistics & History". Baseball-Reference. Retrieved August 22, 2014. ^ Knox, Zak (April 15, 2014). "Daniel Norris on the Road to Baseball Shambhala". jaysjournal.com. Retrieved May 21, 2014. ^ Davidi, Shi (May 22, 2014). "Farm Report: Sanchez, Norris continue to impress". Sportsnet. Retrieved May 22, 2014. ^ Cahill, Teddy (June 2, 2014). "Bryant, Norris honored as top prospects in May". MLB.com. Retrieved June 3, 2014. ^ Davidi, Shi (June 15, 2014). "Jays promote LHP Norris, C Chung to double-A". Sportsnet. Retrieved June 15, 2014. ^ Mayo, Jonathan (June 24, 2014). "Big league power highlights Futures Game rosters". MLB.com. Retrieved June 24, 2014. ^ "Midseason Top 50: Injury Can't Knock Byron Buxton From No. 1". Baseball America. July 7, 2014. Retrieved July 7, 2014. ^ Davidi, Shi (August 6, 2014). "Blue Jays prospect Norris promoted to triple-A". Sportsnet. Retrieved August 7, 2014. ^ Emrich, Robert (August 10, 2014). "Norris excels in Triple-A debut for Bisons". MiLB.com. Retrieved August 11, 2014. ^ Weigel, Dan (August 16, 2014). "Scouting Daniel Norris' 13 strikeout game". minorleagueball.com. Retrieved August 18, 2014. ^ "Twitter / Buffalo Bisons". Twitter. Buffalo Bisons. August 15, 2014. Retrieved August 18, 2014. ^ Lott, John (August 22, 2014). "Toronto Blue Jays not ready to call up top prospect Daniel Norris … yet". National Post. Retrieved October 20, 2015. ^ a b Davidi, Shi (September 1, 2014). "Top prospect Norris gets September call-up". Sportsnet. Retrieved September 1, 2014. ^ Eddy, Matt (September 3, 2014). "Minor League All-Star Team 2014". Baseball America. Retrieved September 4, 2014. ^ Mayo, Jonathan (September 26, 2014). "Unveiling the 2014 All-Prospect Team". MLB.com. Retrieved September 26, 2014. ^ Chisholm, Gregor (September 6, 2014). "Top prospect Norris keeps calm in pressure-packed debut". MLB.com. Retrieved September 7, 2014. ^ Chisholm, Gregor (September 23, 2014). "Gibbons to reward Norris with first big league start". MLB.com. Retrieved September 24, 2014. ^ "Blue Jays pitcher Daniel Norris undergoes arthroscopic elbow surgery". The Globe and Mail. The Canadian Press. October 7, 2014. Retrieved October 20, 2015. ^ a b Cahill, Teddy (January 21, 2015). "2015 Prospect Watch: Top 10 left-handed pitchers". MLB.com. Retrieved January 21, 2015. ^ "MLB 2015 Prospect Watch". MLB.com. Retrieved March 17, 2015. ^ Chisholm, Gregor (January 30, 2015). "Norris leads Blue Jays' Top 100 Prospects quartet". MLB.com. Retrieved January 31, 2015. ^ Chisholm, Gregor (July 30, 2015). "Blue Jays win bidding for prized lefty Price". MLB.com. Retrieved July 30, 2015. ^ Beck, Jason (July 30, 2015). "Tigers move quick, get three pitchers for Price". MLB.com. Retrieved July 30, 2015. ^ Beck, Jason; Emert, Jacob (August 2, 2015). "Norris cools Orioles in stellar Tigers debut". MLB.com. Retrieved August 2, 2015. ^ Garno, Greg (August 19, 2015). "Norris homers in 1st MLB AB, later exits hurt". MLB.com. Retrieved August 19, 2015. ^ Beck, Jason (August 20, 2015). "Tigers place Anibal, Norris on disabled list". MLB.com. Retrieved August 20, 2015. ^ Hogg, Dave (September 22, 2015). "Davis triple in the 10th gives Tigers 2-1 win over White Sox". Retrieved September 23, 2015. ^ Fenech, Anthony (March 24, 2016). "Detroit Tigers' Daniel Norris to start season on the disabled list". Retrieved March 24, 2016. ^ Slonksnis, Catherine (June 21, 2016). "Daniel Norris being recalled from Toledo as Tigers work to limit Michael Fulmer's innings". Retrieved June 30, 2016. ^ Strang, Katie (July 5, 2016). "Tigers place LHP Daniel Norris on 15-day DL with right oblique strain". Retrieved July 7, 2016. ^ Martin, Tim (August 9, 2016). "Detroit Tigers Gameday: Daniel Norris returns versus Mariners". Retrieved August 10, 2016. ^ Trister, Noah (September 12, 2016). "Tigers rally past Twins 4-2, pull within 1 of wild card". Retrieved September 19, 2016. ^ Fenech, Anthony (July 26, 2017). "Tigers' Daniel Norris tried to pitch through injury, dug 'deeper hole'". Detroit Free Press. Retrieved December 15, 2017. ^ "Tigers' Daniel Norris: Heads to disabled list". CBSSports.com. Retrieved 2018-04-30. ^ "Tigers' Daniel Norris leaves start with lower leg injury". Bless You Boys. Retrieved 2018-09-02. ^ Beck, Jason (January 11, 2019). "Tigers avoid arbitration with Boyd, Castellanos". MLB.com. Retrieved January 11, 2019. ^ "Daniel Norris PitchFX at fangraphs.com". fangraphs.com. Retrieved August 3, 2015. ^ Laurila, David. "Q&A: Daniel Norris, Blue Jays Pitching Prospect". Fangraphs. Retrieved August 12, 2013. ^ a b Saslow, Eli (March 5, 2015). "The Man in the Van". espn.go.com. Retrieved March 5, 2015. ^ Liddell, Mackenzie (October 19, 2015). "Tigers pitcher Daniel Norris to have surgery for thyroid cancer". Sportsnet. Retrieved October 19, 2015. ^ Beck, Jason (October 20, 2015). "Norris to undergo surgery for thyroid cancer". MLB.com. Retrieved October 20, 2015. ^ Beck, Jason (October 29, 2015). "Norris announces successful thyroid surgery". MLB.com. Retrieved October 29, 2015. ^ Strang, Katie (January 31, 2016). "A portrait of a pitcher: Daniel Norris' journey to find perspective". ESPN.com. Retrieved January 31, 2016. Wikimedia Commons has media related to Daniel Norris (baseball).